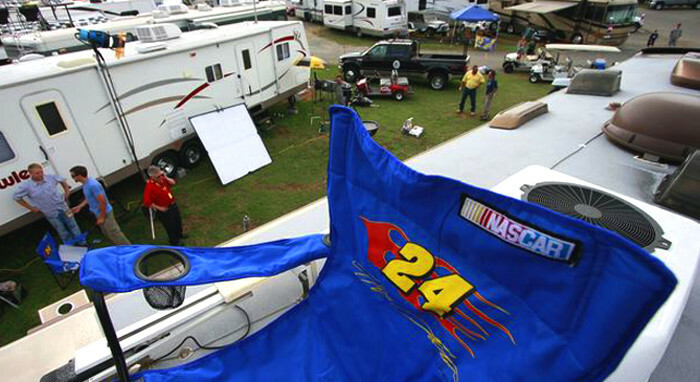 Located just off Bruton Smith Boulevard (1-85, exit 49), the Camping World Racing Resort offers premium RV camping just a short walk from Charlotte Motor Speedway, zMAX Dragway and The Dirt Track. This campground is available for each event held at these tracks and is also available for daily RV camping year-round! These campsites feature electric, water and sewer hookups, picnic table, gravel pads, asphalt roads and WiFi access at the check-in cabin. A modern restroom/shower facility and large covered pavilion for club gatherings/special events are also onsite. Two (2) spot sizes are available: 20’x 50′ and 30’x 50′. During Food Lion AutoFair weekends, standard RVs and tents are welcome.